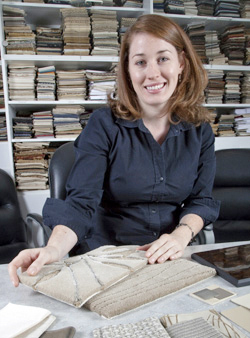 Eco-friendly fabric collections inspired Duncan Designer Lori Browning to explore other products available for "green" aircraft interiors. Many textile companies are creating new fabric lines to meet the “green” demands of the commercial industry. I was inspired by some recent eco-friendly fabric collections, and I found that the properties that make them green also make them suitable for aviation burn regulations. I decided to explore options for a green aircraft interior. What Makes a Material “Green”? Materials are considered green when they are made of renewable, recycled or natural resources. In general, the fewer natural resources and energy that are consumed the better. For example, using a local carpet vendor reduces fuel consumption without compromising the quality of the carpet. Eco-friendly materials aren’t hard to find, and new products are coming out all the time. Fabrics that are treated with stain-resistant chemicals or made of synthetic fibers are more toxic and tend to have more issues passing the burn tests for aviation. More natural materials are less toxic by comparison, and more suitable for use in aircraft interiors. Plus, natural fibers won’t off-gas like synthetic fabrics and carpets, which improves the cabin’s air quality. National organizations such as the U.S. Green Build Council (USGBC), Greenguard, the Carpet and Rug Institute (CRI) and the National Science Foundation (NSF) certify many of the materials presented for use in aviation. How a fabric is made determines durability more than what materials are used to make it. With this in mind, eco-friendly materials can be just as durable as standard fabrics. Like synthetic materials, they can also be treated with Scotch-guard for stain resistance. Do eco-friendly materials improve a client’s bottom line? Prices can vary widely, so yes and no. Some fabric prices are higher while others are very economical. Rapidly-renewable wood veneers are less expensive because they grow more quickly. For those who believe in corporate responsibility, this is an opportunity to lead by example. There are a wide range of colors, designs and options available for eco-friendly materials. Most tend to follow the natural palettes current for commercial and residential design, but the neutral hues work well for corporate aircraft interiors as well. Carpet options are endless, and new fibers such as bamboo are really opening the doors for creative design. You never have to sacrifice quality or aesthetics to go green. Eco-friendly materials can be just as luxurious and beautiful as conventional materials, and the quality is certainly as good or better. To view the latest Duncan Aviation interior refurbishments, visit our recent galleries. Lori Browning is a Designer at Duncan Aviation’s Battle Creek, Mich. (BTL) facility, specializing in business aircraft modifications, completions and refurbishments. She began working in aviation in 2006.